This GRP Composite door was installed in Upper Saxondale in Radcliffe on Trent. Upper Saxondale is a popular installation area in Radcliffe and our bespoke composite front doors are the ideal upgrade. Our installation service comes highly rated in the Upper Saxondale area of Radcliffe and surrounding areas. If you are interested in a thermally efficient composite door installation in the Saxondale area call us on 01157401740. This installation was designed on our composite door designer by our customer with very specific design requirements. 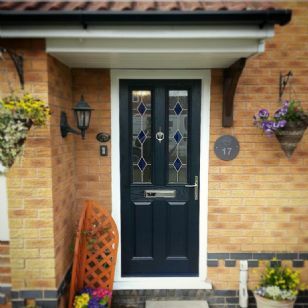 A beautiful design in the dark blue, the 2 panel 2 square design highlights the 3 drop diamond blue argon filled double glazing in this stunning front door. Opting for a cill with the low level frame access make the entrance easy to maneuver with chrome letterbox, handles and knocker just finishing off the look. One of several installation carried our in the Upper Saxondale area. Since the demolition of Saxondale hospital, the old site was developed in to a residential housing estate, near Radcliffe on Trent. The upper saxondale housing estate was build between 1995 and 2001 and is therefore showing some signs of age. For this reason we have installed and fitted many external front doors and interior fire doors in the upper saxondale area. The front doors originally fitted on the properties in upper saxondale are ready for replacement and we are installing many GRP composite doors on the housing estate. Upper Saxondale near Radliffe on Trent is in the NG12 postcode.